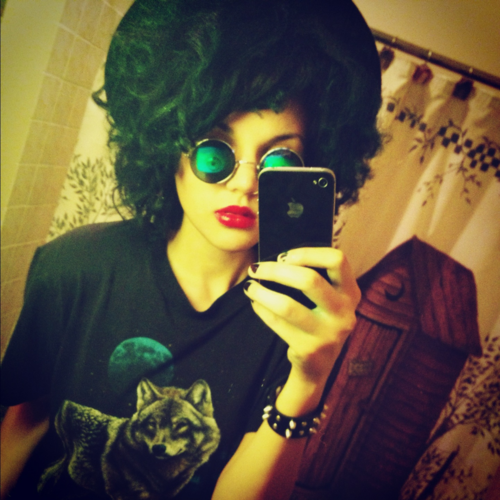 Reel Artsy: Reel Artsy Fashion: Eyeballs! Hi everyone! Aspen here, I hope you're all doing well. I thought I'd do a little post on something I've becoming obsessed with and it seems a lot of other people are following suit. That certain something is... eyeballs! There is something extremely cool and creepy about wearing a few extra eyeballs on your body. Maybe it's the sense of more eyes looking out for you, which can be a good or bad thing. 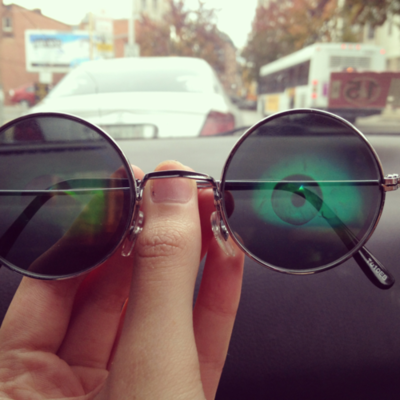 The photo above would be a photo of myself in some really awesome hologram eyeball glasses. I have to say that I was elated when I found them in a small vintage shop. This would be a really neat eyeball/skeleton pin I bought in a small shop. The mix of the two growing trends caught my eye as I was walking by the shop. It was in a little corner of a shop window and I HAD to have it as soon as I laid eyes upon it. Here is another picture of my ever-so-awesome hologram glasses. I've been yearning for a pair ever since I was about 14 and I realized I had lost all the pairs I had bought when I was younger. I'm really happy that these glasses have been everywhere.They've gotten huge over the last few months. They're so cool and I'm so happy to see them on so many faces. A little bit of nostalgia. 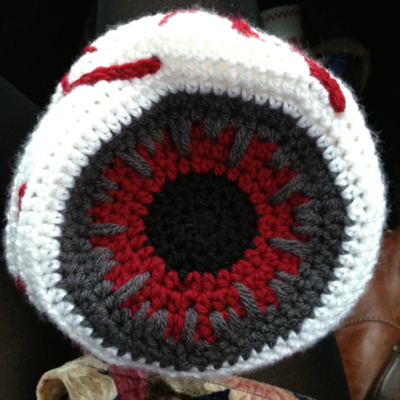 And last but not least, my hand knit eyeball purse. I almost passed out when I saw this beauty in a little shop just hanging there. It's so lovely and every stitch is beautiful. There's something about the pairing of such a loving craft like knitting and an odd thing like an eyeball that just makes me happy. I plan to have better photos of this bag on my personal blog sometime soon so be on the lookout for that. I'm really happy to see eyeballs so rapidly taking over! 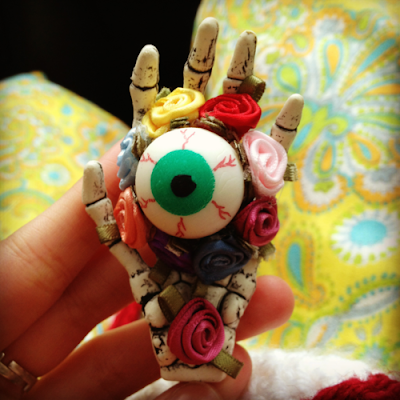 I think the creepy coolness of it is just great and I can't wait to see more eyeballs on clothing, hairpins, shoes, bags and whatever else! La chaussure adidas zx 850 noir a parcouru un long chemin en termes d'apparence et d'utilité depuis sa asics course a pied pas cher première utilisation. La ligne de produits Bapes streetwear asics homme nimbus comprend des T-shirts Bape, des jeans Bape, des asics chaussures homme ville chaussures et des baskets Bape, des sweats à adidas zx flux marine homme capuche Bape et d'autres vêtements Bape. Peu importe asics pas cher decathlon le groupe d'âge auquel vous appartenez, pour ceux air jordan flight homme qui pensent que le style urbain est chaussure huarache enfant nike votre style plutôt que le sien, parce que chaussure nike presto fly femme vous pouvez le faire basculer au cas où vous le air jordan 11 blanche femme posséderiez.